It appears without obvious cause in many cases. Mothers of small babies seem particularly prone to it, but whether this is due to hormonal changes after pregnancy or due to lifting the small object repeatedly is not known. There is little evidence that it is caused by work activities, but the pain can certainly be aggravated by hand use at work, at home, in the garden or at sport. De Quervain’s syndrome is not harmful, but it can be a really painful nuisance. Some mild cases recover over a few weeks without treatment. Through a transverse or longitudinal incision, and protecting nerve branches just under the skin, the surgeon widens the tendon tunnel by slitting its roof. 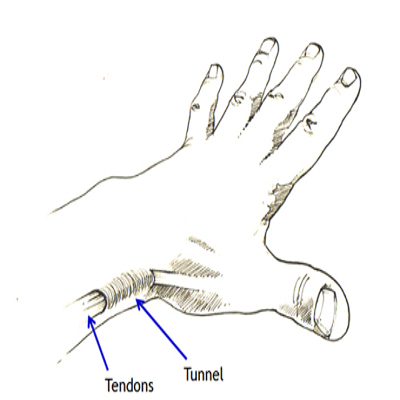 The tunnel roof forms again as the split heals, but it is wider and the tendons have sufficient room to move without pain. Pain relief is usually rapid. The scar may be sore and unsightly for several weeks. Nerve branches beneath the skin may need pulling gently to one side to give access to the tunnel, which occasionally causes temporary numbness on the back of the hand or thumb. Other risks are the risks of any surgery such as infection (less than one in 100 risk) and an unattractive scar.